I have the nicest client ... and she lives right next door! 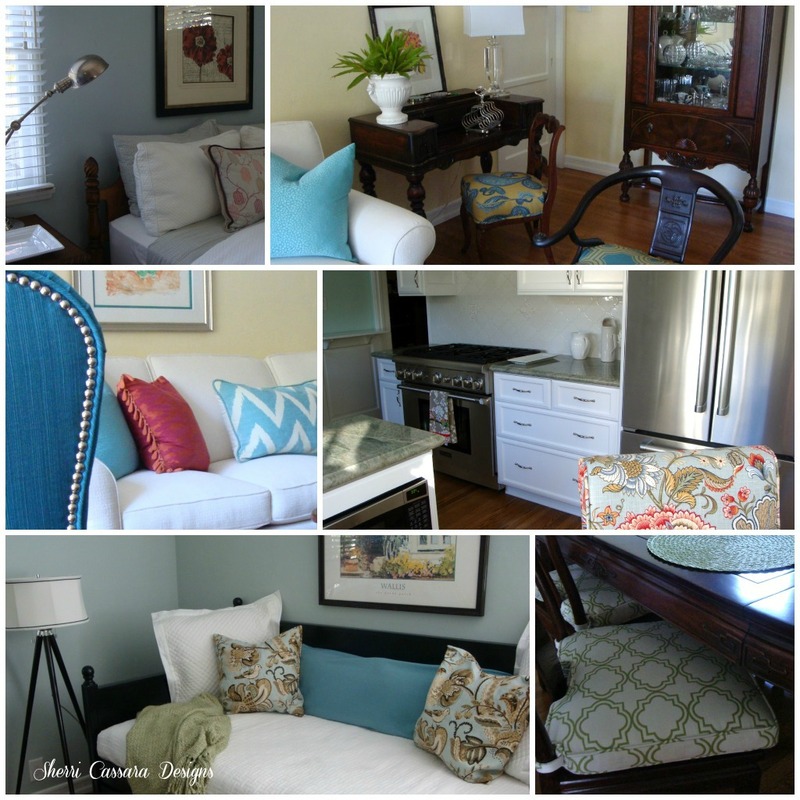 We have had so much fun re-designing her house over the years - bathroom remodels, bedrooms and endless furniture arrangements and accessorizing. 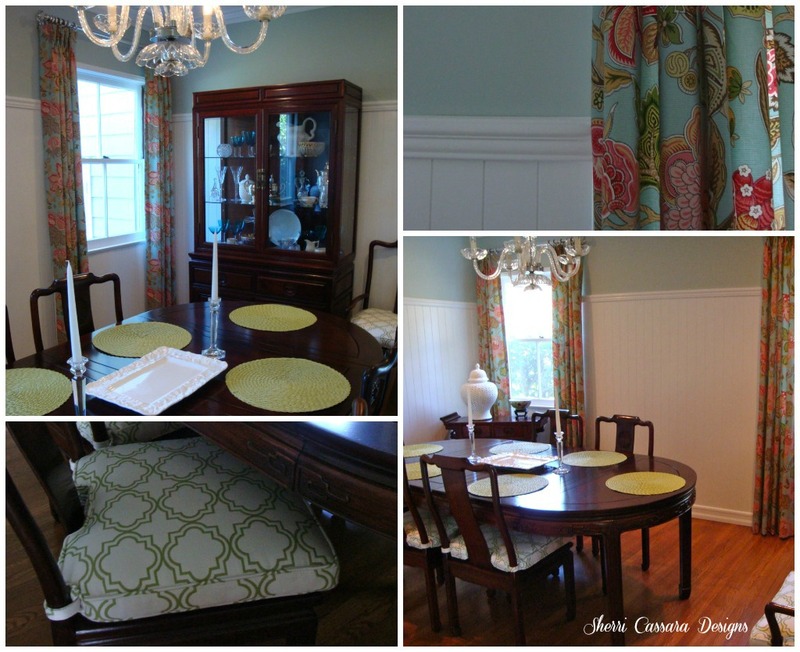 Last year I helped her with a beautiful new living room and then soon after we updated her dining room. But what really needed help was her kitchen. It was in great need of being re-done. Not only was it quite outdated ... but drawers were literally falling apart and the appliances needed replacing. I don't think she ever thought she would get a new kitchen! (Sadly, I never took any before photos. I know, bad blogger skills. I am thinking she would have probably not loved them being shown anyway). It is a small kitchen and the space was being maximized quite well so we only had to make a few changes to the basic footprint. Their biggest issue (besides things being worn out and aesthetics) was a lack of counter space and storage. We moved the refrigerator over about 18" to allow room for a nice sized 36" range and replaced the old refrigerator with a new counter depth refrigerator that gives more room to move around the peninsula. To make up for the cabinet space we lost by moving things down, we relocated the existing water heater that was taking up valuable storage space. The previous counters were 4" white tiles with a dark brown grout. We knew always knew the cabinets would be white but the counter was a harder decision. Although she wanted a solid surface, she was not excited about granite (there were none that she really loved), didn't really like quartz, and marble, although she loved the look was too high maintenance for her. On our first trip to the stone yard we both fell in love with a creamy white quartzite but it ended up being too expensive. She went back to the stone yard and found a soft green granite that goes perfectly with the look she was trying to achieve; a soft and inviting kitchen that goes well with the dining room that is adjacent to the kitchen and allows her to accent with her favorite color ... turquoise. I knew from the beginning that this white Moroccan tile would be perfect for her. 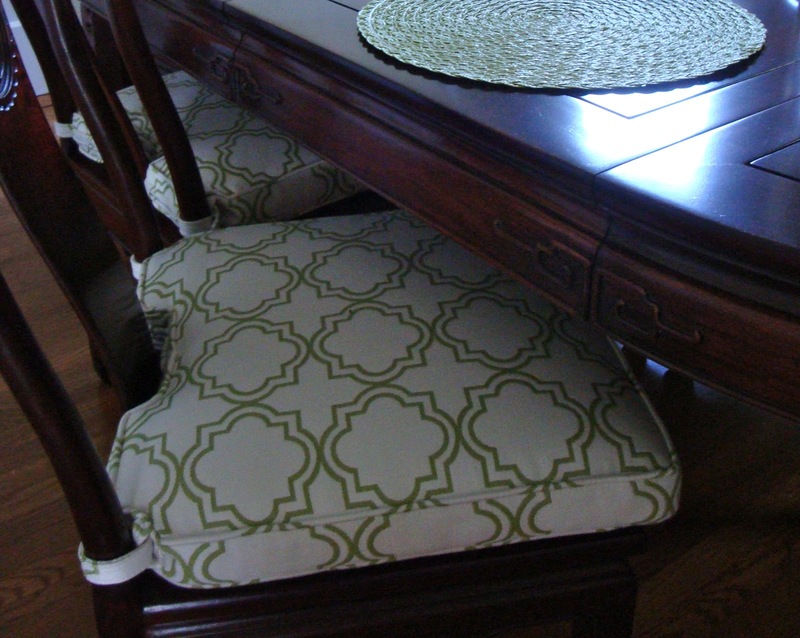 I love how it ties in the chairs in the dining room that is adjacent. She chose the decorative pieces above the range and they are one of her favorite things about the new kitchen. Previously, she had a kitchen table under the window which she used primarily as a desk. We replaced the table with a smaller desk and replaced the dining chairs with one desk chair. It gives more room to access the pantry area and there is more room to walk around. When her grandchildren come to visit she can replace the desk chair with the previous kitchen chairs. We found an inexpensive chair at Pier One Imports that just so happens to look almost exactly like the curtain fabric in the dining room (don't you love when that happens?!). And although I am not sure a house is ever "done", I think we are close ... just one more room to go (the family room!). Sherri it's beautiful! As soon as I saw those cabinets and the pretty blue on the walls in that first photo I knew it was going ot be beautiful. What a treat for your friend. And I love her choice in granite. We are very happy with our granite and I think hers will make her happy for a long time. Is that Palladian blue on the walls? it's beautiful and it all looks so nice together with the rest of her house. What a gorgeous kitchen. Love the backsplash tiles and everything else! What a gorgeous and efficient transformation! 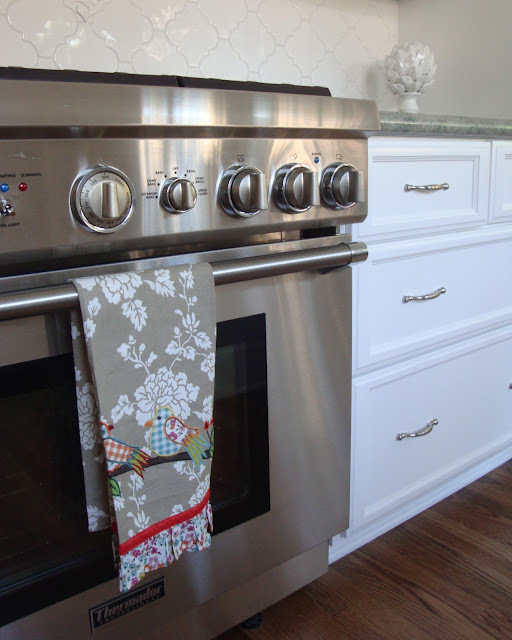 I love the Moroccan backsplash and the fabrics! Lovely kitchen, you did a great job, Sherri! Sherri I just love this kitchen...it shows so Sherri Design! Very relaxing and warm!! Another great job! !